This week we take a look at an AI generated Obama and AI for the visually impaired, the release of a new autonomous, hands-free drone, live-streaming for Facebook’s VR and a Kentucky Fried Chicken phone. Yes, you read that right. Artificial intelligence is converting audio-visual data into realistic mouth dubs and AI is also making it easier for blind and low vision people to interact with the world. AirDog 2 is the new drone for extreme sports enthusiasts, Facebook now lets you live stream from VR and Huawei is releasing a KFC phone. Shake off the work week and kick off your weekend with some Weekly Wins! 1. Obama Said What, Now? When artificial intelligence is left to generate things based on a simple input, the results are sometimes a little… Odd. Researchers at University of Washington, however, have created a new tool that converts audio files into realistic mouth movements that can be grafted onto an existing video of someone speaking. The end result is basically a video of somebody looking like they’re saying something that they didn’t. The researchers used Obama as a test subject because of the large amount of video footage available of him. The footage provided the AI with the necessary data needed to track and replicate his mouth functions. Although an impressive innovation, one can only imagine how awry this could go in the hands of the wrong person (did someone say fake news?). On a more positive note, this means we can probably look forward to a brand new array of lip dubbing videos. Advancements in the tech space doesn’t just mean cool new gadgets for fun. Digital innovations are helping those with disabilities in all sorts of ways. The latest invention is “Seeing AI” from Microsoft, an app that uses artificially intelligent computer vision to describe and narrate the world around those who are visually impaired in real-time. Seeing AI was designed for the blind and low vision community and “harnesses the power of AI to open up the visual world and describe nearby people, text, and objects.” The app has many features including “optical character recognition technology” to read documents and signs, facial recognition, and the ability to identify objects and surroundings. You know those intense extreme sports videos that make your palms sweat? They’re about to get a whole lot more intense with the AirDog 2. Mountain biking, water skiing, and all other adventurous outdoor activities can now be captured on camera with ease, and hands-free, to share with all of us who prefer to… watch from afar. The AirDog 2 will be available for $1500 and combines GPS and computer vision for tracking to follow you while you wear a battery-powered “electronic leash” around your wrist. 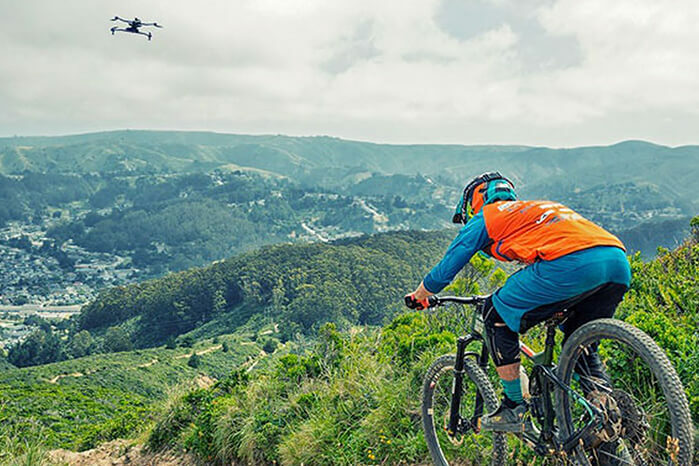 Intended for extreme sports enthusiasts, the state-of-the-art drone features multiple sensors to avoid collisions and is built to withstand challenging weather conditions. Facebook has added a live-streaming feature to its virtual reality app Spaces for Facebook’s Oculus Rift. The app will allow users to stream a 2D feed of themselves to people outside of VR. Similarly to Facebook Live video, viewers can send reactions and comments which the streamer will see floating around in space. The person streaming will also be able to interact with viewers by dragging their comments into the space around them, interacting with reactions, and more. This new feature creates an AR experience as well as a VR experience and is part of Facebook’s initiative to merge VR headset experiences with traditional computing platforms. Ah, Kentucky Fried Chicken. Good ol’ drumsticks, wings, and… phones? 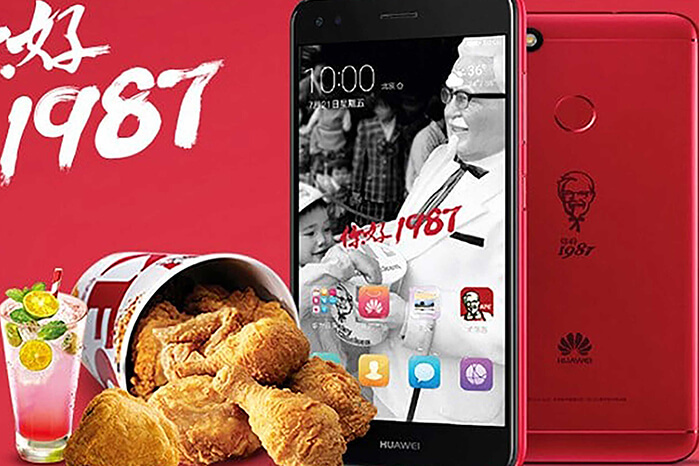 To celebrate KFC’s 30th anniversary in China, Huawei is releasing a Kentucky Fried Chicken phone. For real. The phone comes preloaded with a KFC delivery app and a KFC restaurant music app that allows users to pick songs that will play at different locations. The phone, made in KFC’s trademark red colour, has already attracted a lot of attention, and features Colonel Sanders’ smiling face on the back.